NewsUSAcom Packed in a can like ... mackerel? While tuna and salmon reign as the USA's favorite canned seafoods and sardines have long been known to be convenient and the best health choice, a new fish has been swimming upstream and making a name for itself among seafood lovers. King Oscar, the leading seafood brand known for its premium canned sardines, has seen an explosion in demand for its premium canned mackerel fillets. Thanks to superior North Atlantic mackerel fished in King Oscar's traditional fisheries between Norway and the Faroe Islands, King Oscar is bringing a whole new experience to the canned seafood aisle of your local grocer. Mackerel offers the same firm texture of tuna, with a mild taste and a powerful punch of nutrition. King Oscar now features a full lineup of four different mackerel fillet recipes, including skinless and boneless fillets in olive oil, Mediterranean-style fillets with jalapeno peppers, and even mackerel with olive oil and lemon. The fillets are hand-packed and offer a wonderfully mild alternative to canned tuna. Whether they're added to a salad, a favorite pasta, or even spread on a simple bruschetta, these are a versatile addition to any meal. For seafood lovers who are environmentally-conscious, the new King Oscar line-up is a welcome departure from other seafood sources that are not as environmentally-friendly. Underscoring this idea is a survey that notes seventy-nine percent of consumers who eat seafood say that sustainable sourcing is an important motivator when making decisions at the checkout line. King Oscar was recently awarded Marine Stewardship Council (MSC) Chain of Custody certification for its use of sustainable seafood that is traceable to the source. MSC is one of the most scientifically respected and consumer-recognized fishery and supply chain certification programs in the world. Thanks to its ecologically sound practices from fisheries to canneries, all King Oscar Mackerel Fillet products now carry the MSC blue fish label and are also kosher certified, non-GMO, gluten free and packed in recyclable, BPA-NI aluminum cans. 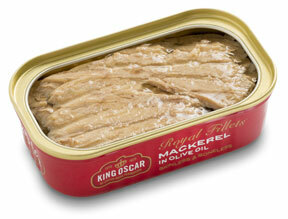 "I know consumers are going to love our mackerel," says John Engle, president of King Oscar USA. "It is a fresh new take on convenient, sustainable and tasty protein. We work especially hard to ensure that our legacy is one of respect and care for the world's oceans, while bringing new innovations to the American diet."